Huawei’s sub-brand Honor launched some interesting smartphones throughout 2018 and to round off a successful year, the company launched the Honor View 20 in December. The flagship offering comes with powerful specifications but there is a unique aspect that makes the company’s latest somewhat more special. The brand has opted for a punch-hole display design, which is expected to feature in different forms on Android smartphones in 2019. We managed to get our hands on the Honor View 20 before its official launch and here is our unboxing experience and the first expressions. Jumping into the unboxing experience, the retail box for the phone is fairly uncluttered and comes with a SIM-ejector tool, a TPU case, wall charger and a USB type-C cable, along with the View 20, of course. Coming to the handset itself, the glass back on the Honor View 20 comes with an attractive laser-etched ‘V’ shape that appears to be moving when you see the phone from different angles. Unfortunately, with the glass finish, the phone also acts as a fingerprint magnet. You’ll find the company’s branding in the bottom half of the rear panel and the fingerprint sensor is placed in the middle. Thankfully, we did not have to stretch our index finger much to find the biometric sensor at the back. There are two cut-outs for camera modules, which are assisted by an LED flash. I personally think that Honor could have avoided the ‘AI VISION’ tag present on the right of the camera module but as the font size of the inscription isn’t that large, it’s borderline passable. There’s a volume rocker on the right side of the handset, placed above the textured power button. 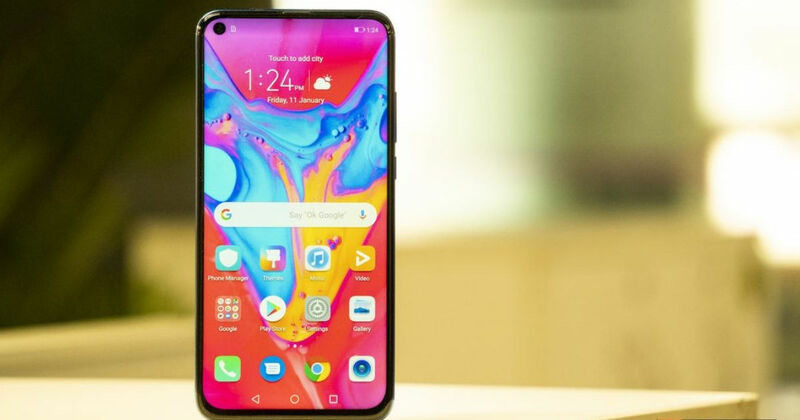 The SIM card slot is present on the left side of the Honor View 20. For charging, there is a USB type-C charging point on the bottom, alongside speaker grille. The good news is that you can find the 3.5mm headphone socket at the top of the phone, which is sitting right next to the IR blaster and proximity sensor. We cannot delay discussing the most interesting aspect of the Honor View 20 any further. The phone ships with a punch-hole display which dominates the entire fascia and features a circular cut-out on the top-left side to house the front camera. The natural curiosity that any user would have is whether this cut-out design looks and feels impressive or obtrusive. Although a good implementation of this design might change our perspective later, the cut-out design is a bit of hit-and-miss over here. The noticeable display bleeding just around the cut-out is a letdown when you look up close. However, while watching videos, you won’t notice this bleeding and as the 6.4-inch FHD+ IPS LCD panel on the View 20 is pleasantly vibrant, the phone ends up providing a good window for your entertainment needs. In our limited time with the Honor’s latest, we could only manage to use it indoors but from the initial looks of it, the maximum brightness might be an issue under harsh sunlight. In terms of the optics, the 48MP primary sensor is placed beside a TOF 3D stereo camera in the rear-facing module. Again, within the limitations of our testing, we found that the phone managed to capture some really sharp and detailed images, even indoors. On the software side, the View 20 runs Android 9.0 Pie-based Magic UI 2 out of the box. In our brief usage, the UI does feel a little bit on the heavier side with many tools pre-installed and proprietary company software. However, the Kirin 980 chipset, assisted by 6GB RAM, managed to breeze through the platform in our testing time with the phone. We did not face any lag issues navigating through the UI and everything felt buttery smooth. To get the rest of the specifications out of the way, the View 20 comes with a capacious 4,000mAh battery, 128GB of storage, and a Mali-G76 MP10 GPU. As the company has not announced its pricing, we will have to wait and watch the segment that the View 20 will be competing in. If we go by the phone’s China pricing, the handset will be competing against the likes of ASUS ZenFone 5Z (review) and OnePlus 6T (review). We’re putting the handset through its paces as we speak to see how the View 20 fares against its rivals, so keep an eye out for review.